PASAY CITY, Philippines — As part of Sofitel’s celebration for the Yuletide season, the annual “Christmas Trophy 2013” Facebook competition among all Sofitel hotels worldwide launches this week. Participated by 75 Sofitel hotels worldwide, this competition aims to highlight the creativity of each property to exhibit a Yule Log cake that would best represent the merriest season of the year. Last year, Sofitel Manila won the title of the “Most Liked Bûche de Noël” on Facebook award with the entry “Le Cercle de la Vie Bûche de Noël” or “The Circle of Life Yule Log Cake” inspired by the resilience, passion and strength of the Filipinos through adversity. This year, Sofitel Manila revives the concept as it is most fitting since the year 2013 leaves the Philippines so much to remember. In the past months, the country has suffered and was devastated by several calamities, which include the 7.1 magnitude earthquake in Bohol that ruined century old churches and communities, and the recent horrific scene caused by the huge storm surge and massive flooding of monster typhoon Haiyan (local name: Yolanda). In a country well-known for having the longest Christmas celebration in the world, it is quite unfortunate that such trials and challenging situations can hinder in celebrating the happiest season of the year. But amidst the magnitude of the destruction caused by the recent untoward incidents, Christmas is still a season to welcome especially in the eyes of a child. The innocence, the imagination, and the raw ingenuity of a child makes this occasion surely one that shouldn’t be missed. A child’s creativity to find beauty beyond all the negativity around him and managing to smile, inspire and dream of a brighter day make enough reason to still be merry on this festive time of the year. 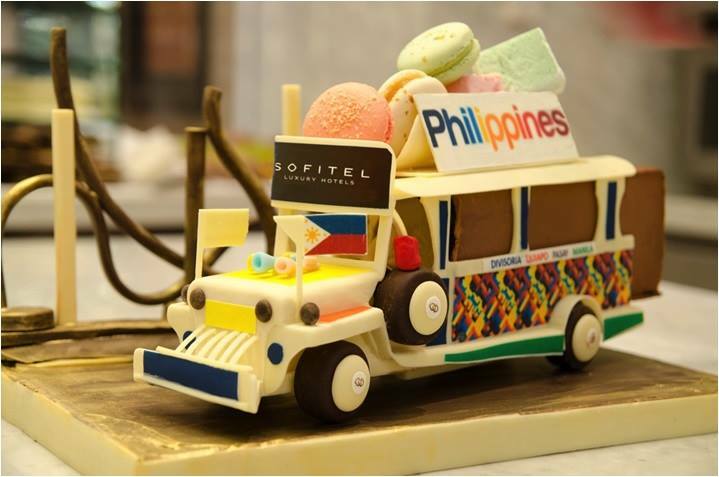 Sofitel Philippine Plaza presents “A Filipino Child’s Christmas” created by Executive Pastry Chef Edgar Butawan who hails from Leyte, one of the Philippine provinces badly hit by the recent massive storm surge. In order to create an elegantly designed log cake that would inspire the Filipino nation to move forward despite all the recent catastrophic incidents in the country, he took inspiration in reflecting a child’s innocence, creativity and ingenuity amidst challenges. Chef Edgar also took inspiration from the children of Virlanie, our supported foundation, who are undoubtedly resilient in dealing each of their own battles. Chef Edgar’s vision is to create a unique Christmas log cake that will represent a child’s innocent view of the joy of Christmas and will symbolize not just the Filipino artistry, resiliency and the hope to move on, but also to reflect the cultural link between France and the Philippines. A blend of two unique cultures, Sofitel Philippine Plaza’s Bûche de Noël entry illustrates all seven characters of French Elegance: Allure, Raffinement, Gourmandise, Suprise, Ouverture, Audace, and Metissage – in an irreverent way that is truly child-like. Showcasing flair through a different set of eyes, delighting the senses, vivid imagination, daring to be different and take off the beaten path, yet adapting to the present – “A Filipino Child’s Christmas” exemplifies how cultural differences can blend and create something that is very timely and inspiring. The two cakes (jeepney and log) are put together to show that regardless of the uniqueness and differences, combining French and Filipino culture would create something very beautiful and fascinating, especially for a child. Sofitel Manila’s Bûche de Noël cake ingredients include authentic Filipino flavors sourced from the different parts of the Philippines. The ingredients include Laguna coconut powder, South Cotabato passion fruit, cocoa powder from the famed Malagos Farm of Davao and the world’s sweetest mangoes from the Island of Guimaras. 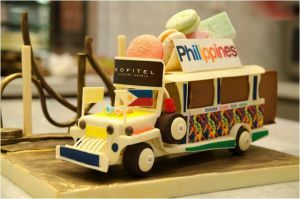 To vote for Sofitel Philippine Plaza Manila’s entry, please go to https://www.facebook.com/Sofitel/app_461203320657038. To discover Sofitel Manila, please go to http://www.sofitelmanila.com.